Sophomore year has just begun, and Angie is miserable. Her girlfriend, KC, has moved away; her good friend, Jake, is keeping his distance; and the resident bully has ramped up an increasingly vicious and targeted campaign to humiliate her. An over-the-top statue dedication planned for her sister, who died in Iraq, is almost too much to bear, and it doesn't help that her mother has placed a symbolic empty urn on their mantel. At the ceremony, a soldier hands Angie a final letter from her sister, including a list of places she wanted the two of them to visit when she got home from the war. With her mother threatening to send Angie to a “treatment center” and the situation at school becoming violent, Angie enlists the help of her estranged childhood friend, Jamboree. Along with a few other outsiders, they pack into an RV and head across the state on the road trip Angie's sister did not live to take. It might be just what Angie needs to find a way to let her sister go, and find herself in the process. e.E. Charlton-Trujillo is the author of Fat Angie, which received a Stonewall Book Award. A filmmaker and YA novelist, she lives in California. Fortunately and refreshingly, the text gives Angie no weight-loss arc...A welcomingly awkward, offbeat journey for a "gay-girl gay" girl with many heartaches. In this companion to the Stonewall Award–winning Fat Angie, Angie’s girlfriend has moved away, Angie is constantly bullied as she starts as a sophomore after repeating her freshman year, her mother still can’t stand her, and her former best friend, Jamboree, is back in town...it’s still good to see Angie, a very human combination of neuroses, fears, truths, and desires, break through some of her defenses and take risks, from singing to loving. Although familiar road-trip tropes appear—the airing of grievances, past histories, new friendships, hints of romance—the story has a force and freshness, thanks to the dynamic third-person narration, a welcome change from the ubiquitous first-person voice of YA novels. There is an intensity to the story that makes no attempt to quell or disguise Angie's fury and depression, yet is full of humor. An engrossing read, uncomfortable in the best possible way. Angie’s grief arc is credible and even laudable, especially as she focuses her anger on apt targets this time instead of herself. Readers will need to be familiar with the first book (Fat Angie, BCCB 4/13) to understand the full details of her previous year, but the multiple references allow readers to infer the basis for her emotional state and follow and applaud her progress from victim to rebel. 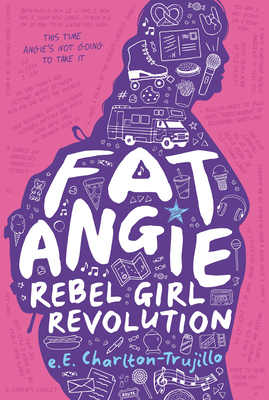 A sequel to Stonewall Book Award Winner Fat Angie, e.E Charlton-Trujillo’s Fat Angie: Rebel Girl Revolution finds Angie grappling with a new set of circumstances. Quick, compelling prose propels the often poignant narrative about one girl’s perseverance despite suffering. e.E. Charlton-Trujillo does an amazing job portraying her entire cast of characters, making each of them seem fully realized and distinct. She handles issues of mental illness, grief, loneliness, and even the cringe-inducing abuse and bullying that Angie suffers with deftness and grace. More importantly, Charlton-Trujillo allows space for hope and strength in Angie’s story while avoiding the neat packaging of a happily ever after. As Angie realizes, “her life…was never going to be a made-for-television Christmas movie…but it was hers,” which, in the end, is all any of us can hope for. Charlton-Trujillo's approach to telling Angie's story fits perfectly with her main character's thoughts, and a lot of those thoughts are dark and angry because Angie's life is filled those things. Happily, Angie is remarkably resilient, and there's enough humor, love, and adventure to balance the pain...There are many great observations in FAT ANGIE, and many lessons about grieving, friendships, and self-love. This isn’t a pretty story; it’s a gutsy genuine story that teens of all sizes and struggles will relate to.